Delft showed us how a quaint college town can provide ample bike parking and covered bike parking in the midst of a historic city. Utrecht taught us that we can preserve the treasured history of a city while still modernize the infrastructure. The Hague exemplified how even with all the political and governmental buildings, a cyclist can still find routes and connections with transit. If the King and Queen can ride the streetcar, so can you! And finally, Amsterdam showed us that no matter the size or population density, cyclists can still successfully navigate the busy (I repeat, busy) streets. The United States prioritizes cars when designing transportation routes, and gives cyclists and those desiring public transit a backseat. 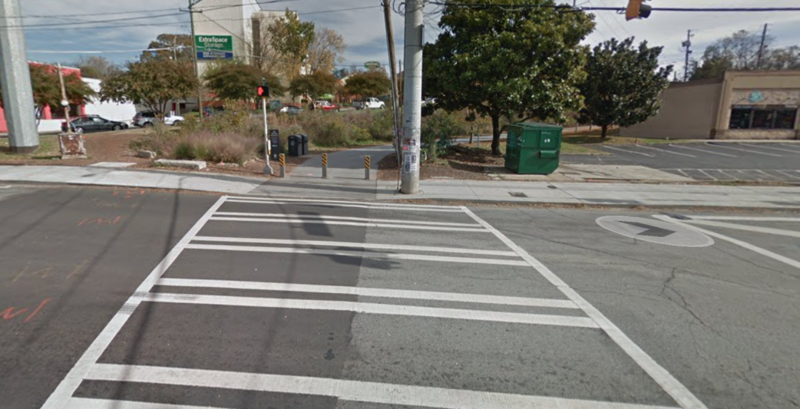 In Atlanta, bikes are allowed to traverse the streets but the infrastructure does nothing but discourage this practice; tight lanes, fast design speeds, and the lack of separation for safety all prevent the average cyclist (me) from hopping on a bicycle. In the Netherlands, separation for pedestrians, cyclists, and vehicles allows for each modal user to feel comfortable in their own space. Low design speeds, smooth surfaces, easy way-finding, and traffic calming design techniques contribute to the Dutch cycling enthusiasm. Their designs also combine transit and biking facilities, which, upon returning home, I have determined to be one of the most critical ways that the United States must improve. Not everyone is capable of cycling 20 miles to work. 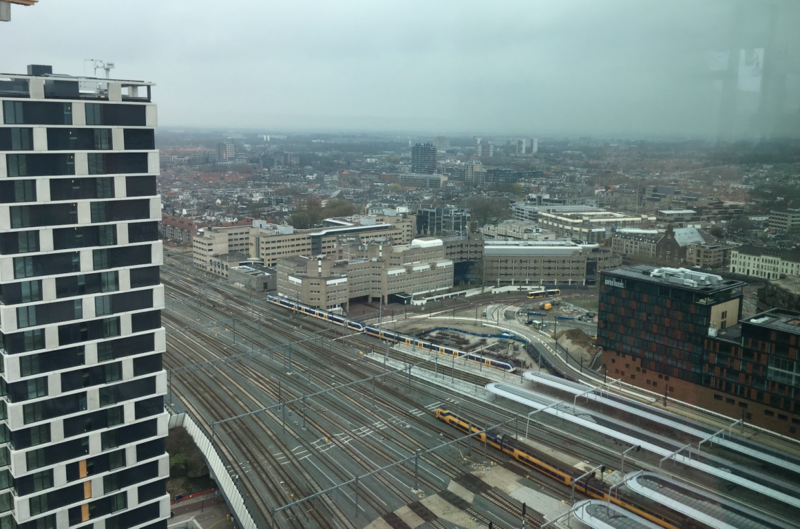 The Dutch know that, and offer their population the realistic option of biking 5 miles to the train station, parking their bike at a covered facility, and enjoying a relaxing, prompt, 15-minute tram or train ride. How has their Culture influenced their Design? In addition to design, the Dutch culture supports the overwhelming interest in cycling. It all comes down to the history of how the Dutch built the infrastructure they now have. 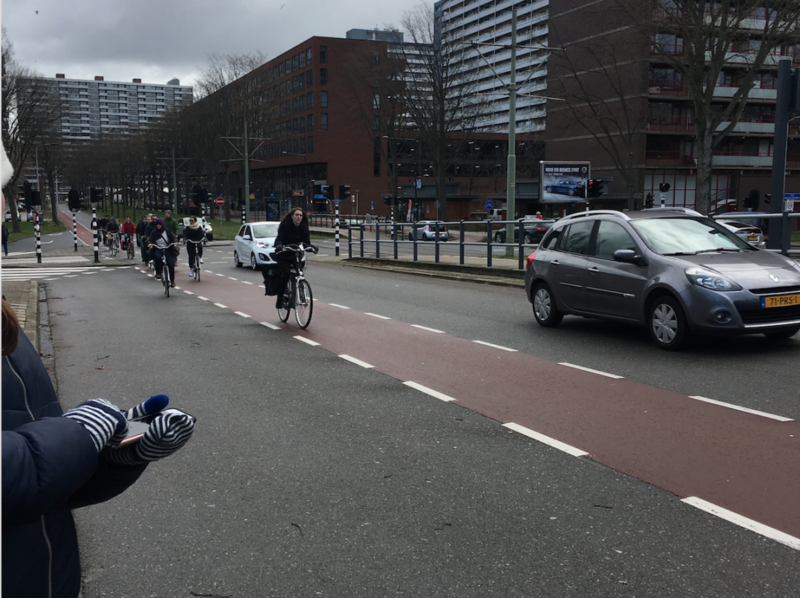 With motor vehicle accidents causing deaths to skyrocket, especially in children, the Dutch became strong proponents of putting an end to the car-centric attitude that once shaped their planning policies. The Dutch also value sustainability and believe that cycling is one way to promote joy and a healthy lifestyle. That said, most do not think biking should be considered a serious sport that requires equipment and heavy gear. Dutch culture represents a desire to cycle casually and practically, and the design reflects that in providing separation and pathways that connect points of interest and necessity. Okay, so how does their Design influence their Culture? 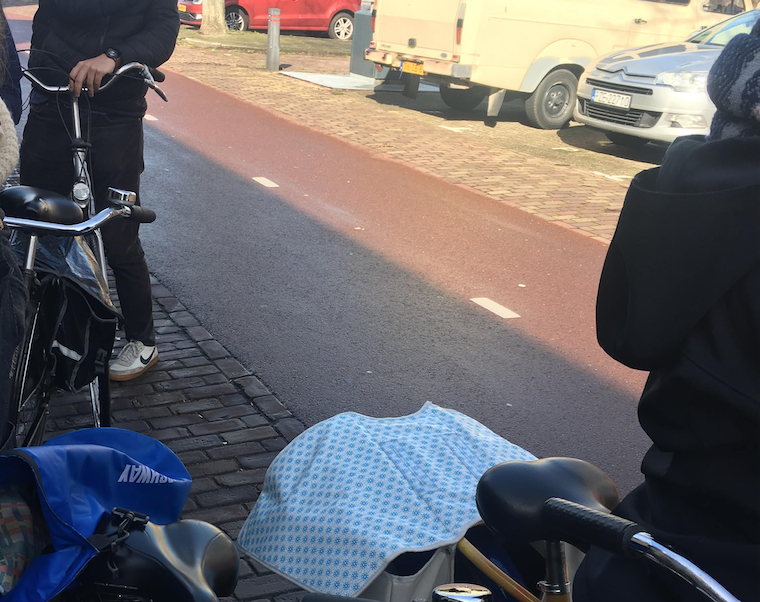 The Dutch design – separation and protection for cyclists – allows for people to not really consider themselves cyclists, but rather people using bikes to practically get from one place to the next. Since deciding to bike to work does not present itself with a long list of cons as it would in the States, biking can be perceived as it should be: a safe, relaxing, practical way to get around. 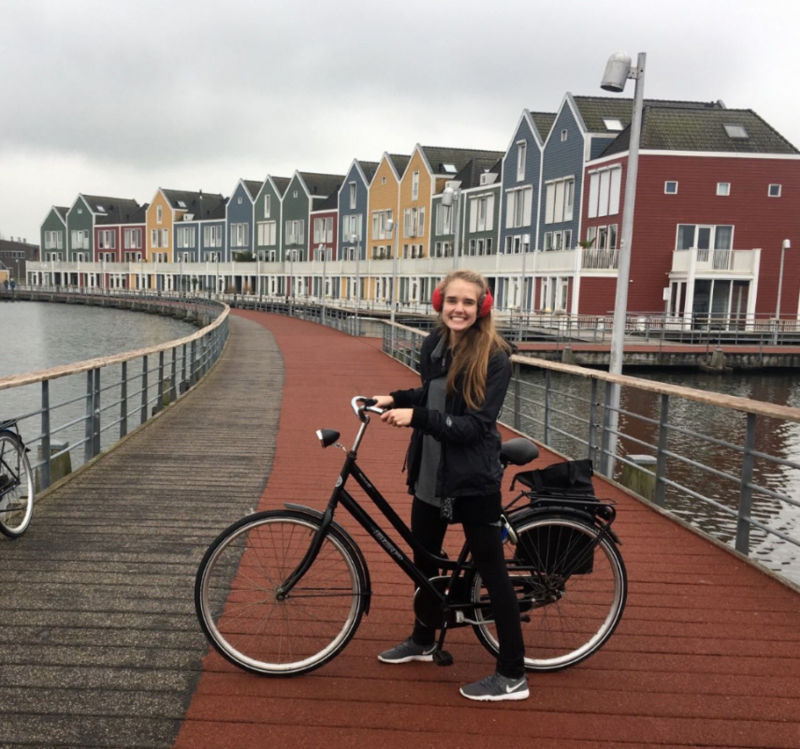 Certain designs, such as the situation in Houten, go even further to create strong communities of people that really can bike to most places they need to visit. The Dutch cycle tracks and fietstraats allow for a relaxed, friendly culture, one in which people can easily cycle two abreast and chat casually. Thank you to all the professionals, my classmates, Dr. Watkins, April, and Dave for this unique opportunity to learn so much! Through the past few days we have seen multiple different ways to get around town and travel from city to city. The first few days we traveled primarily by trains that connect city to city. Then, the tram, most similar to the streetcar, was introduced to us. In Amsterdam, we used the Metro and the tram to move from location to location in our self-guided transit tour. Each transition was fairly seamless, especially for us foreigners, and the maps and way-finding devices were easy to understand. This was validated by our ability to navigate throughout the city with such a huge group and barely slip up. I have only ever used MARTA, and therefore was overwhelmed by the options available to me and pleased with how well they work. In Marc Drost’s presentation on Amsterdam public transit, he emphasized that as Amsterdam expands geographically and demographically, the need for an even more effective public transit system must exist, especially if they want to limit car usage. Every station has bright screens that accurately predict the next tram. As the Dutch tend to be on time and value accuracy, their transit performance reflects that in examining on-time arrival data. In addition to that, the quantity of daily trips and travel times are used to estimate future need and suit the public better. Many of our public transit visits began on bike, and there was never a problem making sense of the process of parking your bike and riding on the train. Frequently in Delft we parked our bikes and then travelled via train, and while occasionally it was difficult to find everybody a space, it tended to be a quick process. In other cities such as The Hague and Utrecht, similar facilities exist. 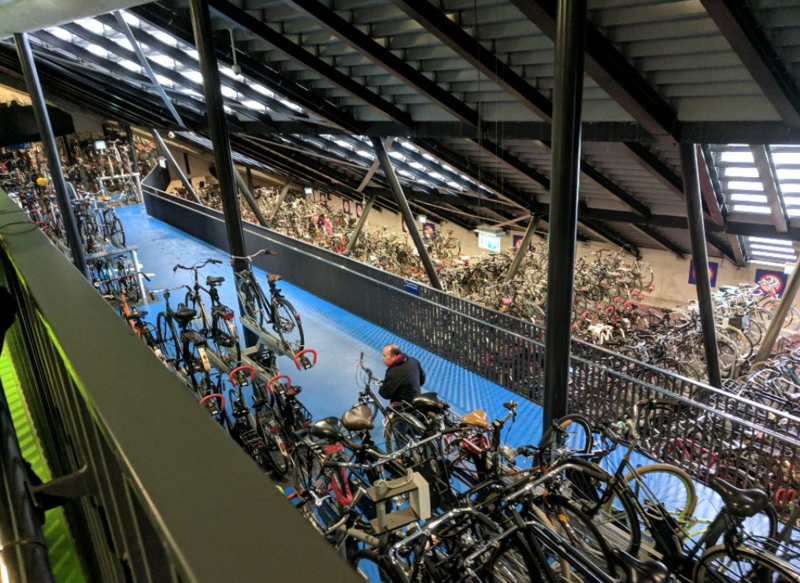 Figure 1 shows the abundance of bike parking available in Utrecht, where 12,000 bikes can be stored. I would go so far as to say that because they were so commonplace, we became desensitized to the scope and magnitude of these bike parking facilities. If you were to bring your bike onto the train, you would only be allowed to do so during non-peak hours and you must pay a fee of 6.90 euro for 24 hours. This is to prevent overcrowding on the trains. It also encourages people to take advantage of a bike share program; many people keep a bike in their hometown, use that bike to travel to the train station, take the train, and then use a rental bike in their work location. Bike paths provide a clear way to go from the city to the bike parking, where entrances to the station border the bikes. As the week progressed and we visited bigger cities, the public’s reliance on public transit became more and more evident. Looking out to the city of The Hauge in Figure 2, it reminded me of looking at Atlanta’s connector. However, in Atlanta, cars dominate the city’s artery, whereas in Netherlands the train and tram serves this purpose. The Dutch system we got to see is next to perfect; while a few information boards were broken and a few trams were overcrowded, the public transit facilities seen were accessible, polished, and effective. Again, as someone who only uses MARTA heavy rail for short distances, I really enjoyed the ability to sit on the train and travel quickly during peak hours while relaxing, which is not like the experience of driving through Atlanta rush hour. In the future, I question how Amsterdam especially will be able to maintain bicycle parking facilities while expanding the trains’ and trams’ reach and scope. Houten offered a new picture compared to what we saw in Delft. For the past few days, we have been able to navigate our way around the historic Delft and interact with varying infrastructure that provides a seamless way around town. In Houten, a city in Utrecht curated to be a “liveable city,” was designed with a very specific image in mind. As Andre Botermans said, Houten is intended to not just be a cycling city, but a city where people can walk and cycle easily, and children can play. Cars simply do not fit into that formulation. To compromise and service those that work and frequently travel outside the city, there are ring roads around the city that allow for vehicular traffic flow around the perimeter. Within the city, bike routes come in all forms: quaint paths, wide paved streets, and tunnels all provide safe connections between points of interests and neighborhoods. 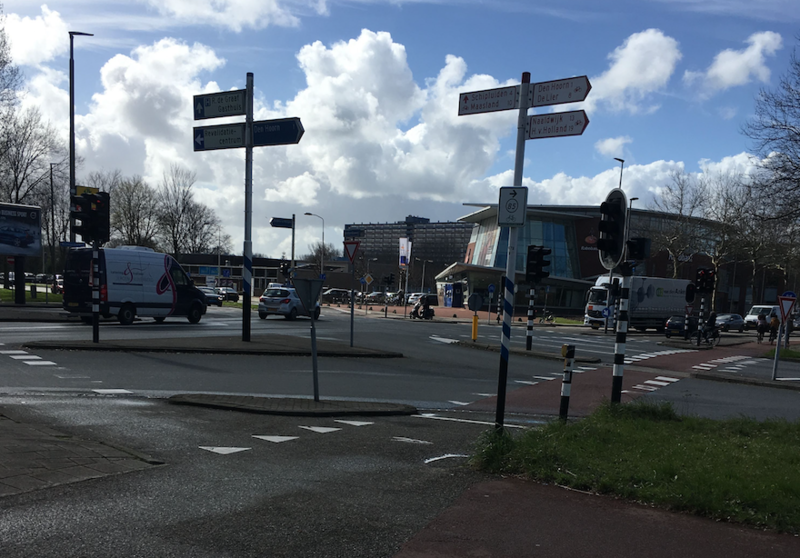 One unique feature that attests to Houten’s commitment to safety is a two level roundabout that separates cars and bikes entirely, pictured in Figure 1 below. The approach Houten takes requires a wholehearted pledge to the community that cycling is prioritized, and in turn the public responds by trusting the infrastructure; this includes letting their children bike to and from school alone, fully utilizing the paths, and limiting personal car usage. Today, we were let loose to bike around this bicyclist’s paradise and find out for ourselves what paths to blaze, and determine whether or not this type of city could exist in the United States. We started out uncertain of destinations we wanted to see, but quickly found that as long as we stayed within the ring road’s confines, we were bound to see some interesting design features. Besides passing through the old village and the city center, most of the sights seen included residential districts and schools, connected by well-maintained, wide paths. Older folks were seen walking around leisurely, kids biked to school, and, to our surprise, a fair amount of cars snuck up behind us and kept us on our toes, which we did not expect to encounter. We passed through a set of “rainbow” houses, pictured in Figure 2, unique playgrounds, and well-designed park areas that led me to really understand just how planned out this town was and still is. Truthfully, the uniformity was very strange, and I felt because of the homogeneity and perfection the city boasts, some character was lacking. With each new feature we encountered, it had me thinking how unlikely this would be in the United States in a city comparable to Houten. I can imagine a very undeveloped city, possibly near the coast with a wealthy population and ideal climate, being able to plan their city with Houten in mind. A town like Daniel Island, near Charleston, comes to mind, as it was developed recently and has plenty of right of way to create a system like Houten boasts. It would have to be an “oasis” of sorts, with all the right boxes checked. I think a very important piece that was not mentioned enough today is the necessary public transit piece. 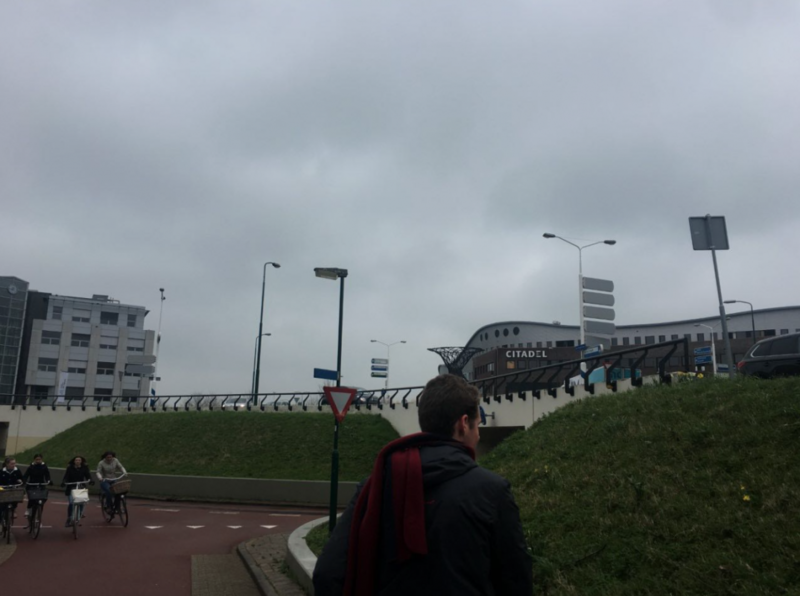 While it is clear Houten’s residents enjoy the quaint feel their city has to offer, over 2/3 of their inhabitants work outside of the city, and this is where mass transit is so key. This is also where I have a difficult time seeing a small city adopt Houten’s design idea. With that idea eliminated, a small city closer to in-place public transit is the next contender for this bicycle oasis. With the connection to mass transit, adequate funding, and with a wide shift in mindsets from the public – and I’m not sure which of those is harder to come by – the ring road design could be implemented in smaller towns that are either undeveloped, or require and have the space for redevelopment. Upon arriving to the Netherlands and retrieving our bicycles, it quickly became clear how prevalent cycling is in Delft. 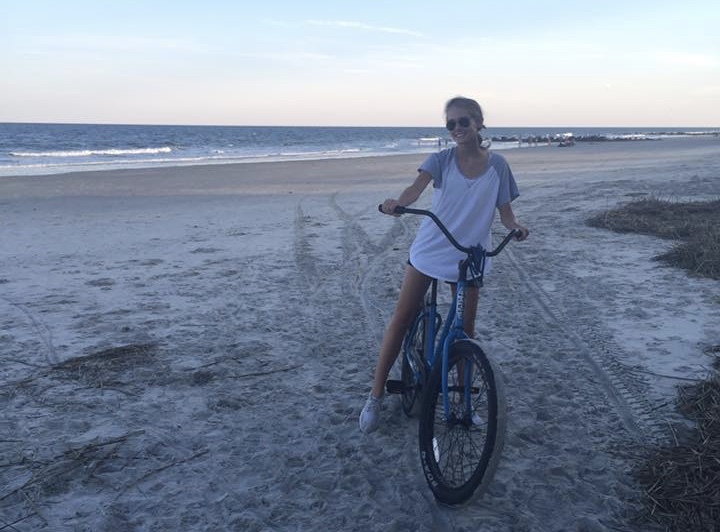 However, on our first day of real biking, I was surprised by how difficult biking was. In Atlanta, biking is difficult because of a lack of infrastructure and awareness, and the resulting lack of safety. On the way to Maeslantkering, the sights were beautiful, the infrastructure varied in design but was consistent in that it provided a safe spot for bikes, but the wind was brutal. This made it tough to adopt the Dutch mindset that cycling is always a viable option for realistic distances. Passing through tunnels and riding primarily on cycle tracks and paths dedicated to biking in the countryside, your next move as a cyclist was never a serious thought. This sentiment continued throughout the next day, and I expect it to continue throughout the week. This is a new feeling for me: not having to question if your security as a cyclist is going to suddenly disappear and you’re going to be stuck on a freeway. Monday focused on Delft cycling infrastructure and different types of pavement and road design. We saw roundabouts that gave cyclists the right-of-way, advisory lanes, bike lanes and cycle tracks, all pictured below in the respective order. The main feature that I believe contributes to the cyclist culture is the slow vehicular speeds. There were plenty of roads where cars came uncomfortably (by Atlanta standards) close to me, but I was not afraid because they were driving cautiously. While cyclists are prioritized in that they are given the right-of-way at an uncontrolled intersection with vehicles, I would not say bikes are always the top dog. Plenty of times during the bike rides we had to unexpectedly brake for pedestrians. Equally as often, we would not be given much time to pass through the intersections, as the bike signal seemed to pass very quickly. I can see a proud American cyclist becoming frustrated with the inability to travel right alongside vehicles rather than opposing them at certain intersections with the 2-part turns. This type of design can be seen in the following figure. Especially in Delft, cycling is seen as second nature. All types of people bike on all types of bikes. We’ve seen older women biking with dogs in their front baskets, two young girls biking separately while holding hands, young men biking with no hands, and plenty of people biking with flowers in hand. My main takeaway from these last few days is that while cycling here seems so easy, our group is definitely not apt yet. 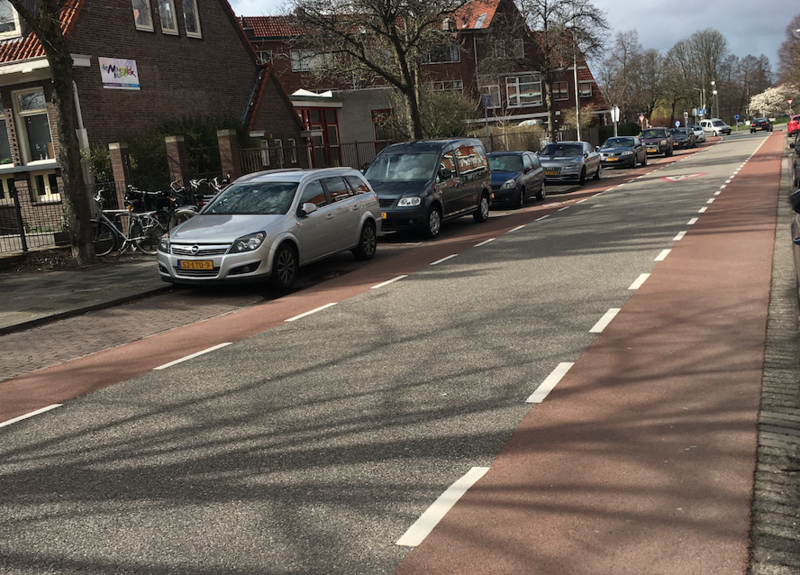 While we understand and appreciate the seamless transitions from advisory lane to cycle track, we lack the awareness the Dutch have that is so crucial to their successful commutes. At intersections, locals seem to have a second sense about who goes first if both bikers arrive simultaneously, and what to do in the case that a pedestrian, cyclist, and car all arrive together. I hope that throughout the rest of the trip we improve in our awareness and can begin to really bike Dutch style. The language the Dutch (and other Northern European countries) have been speaking for years is finally beginning to be understood by the United States; cycling is beneficial in reducing motorist traffic, carbon emissions, and nonrenewable resource consumption, and increasing daily physical activity and the ease of transportation. Through coordinating infrastructure, programs, and policies, the Dutch view cycling as a very practical, efficient, and healthy means of transportation (Pucher & Bueler 2012). Land use and car-restrictive policies contribute to the inclination of the Dutch to cycle. Mandatory training courses and a separation between cyclist and motorist contributes to the perception that cycling is safe and a welcome alternative to driving. These factors create a society of people that choose to bike and find immense joy in cycling (Harms & Kansen 2018). The Dutch value this ability to get to and from on a bicycle, no matter what age or gender you are, and no matter where you’re headed. The United States has a lack of separation between motorist and cyclist, and a generally unfamiliar relationship between most people and cycling; two very different pictures are painted when comparing the two nations. Urban sprawl and government policies encourage a car-centric trend for design and roadway use, and biking is viewed as a recreational activity, done by either children or only very serious, confident cyclists. With that, a few major cities in the U.S. have seen increases in biking populations and have attempted to alter the infrastructure so that the trend continues, such as Portland and Minneapolis. Large U.S. cities especially could really benefit from adopting the Dutch ideas; biking is attainable close to city centers where commerce is more localized, universities with large populations of students more interested in biking exist, and where the topography supports cycling. To fully adopt Dutch ideas, training programs must change (such as enhancing Drivers’ Education), and more people must start biking. For cycling to become a daily activity that is safe, it must become more prevalent. Something I had never considered before was the transition from the old issue with cycling – the lack of actual pavement – to the current – a proliferation of fast and frequent motor vehicles (Pucher & Bueler 2012). In response to the influx of cars in major cities and a desire to push cycling onto the general population, the European policy included creating a separation between cyclists and motorists, traffic calming techniques, and cycle tracks. On the contrary, the United States chose to integrate cars and bikes. The Dutch believe that there should be physical separation on any street with 2+ lanes, any urban street with the speed limit exceeding 50 km/hr, and any rural road with speeds exceeding 60 km/hr. The only situation in which bikes are mixed in with vehicular traffic is for slow speeds, low ADTs, and when there are no car lane markings. The Dutch prioritize the cyclists, and it shows through their infrastructure design. The United States, on the other hand, does not offer any source of relief for cyclists no matter the speed or number of vehicles. AASHTO believes it cannot please every type of cyclist, and therefore should not try to create guidance that would only please the slower, leisurely cyclist or the serious, confident cyclist. This mindset wonderfully correlates with the low-cost that comes along with markings and signage rather than cycle tracks and raised cycle paths. Claiming Dutch facilities to be inconvenient and indirect, John Forester’s idea that “cyclists fare best when treated as vehicles” has contributed to the lack of progress. Recently, with the creation of the Urban Bikeway Design Manual and an interest in different types of facilities (standalone paths, cycle tracks, contraflow, and local streets as bike routes), there appears to be progress towards shifting the American infrastructure more towards the Dutch. That said, for real change to occur, interest must increase along with a dedicated coordination between planning, regulations, and funding. One of the most important takeaways from Pucher and Buehler’s analysis is the relationship between the amount of cycling and how safe cycling is. Cycling is fundamentally a safe, healthy activity that almost anyone can (and should!) be able to do. However, the average American questioning whether or not to cycle to work will inevitably choose not to, and the lack of perceived safety is often cited as the prominent reason why. This perception only aggravates the issue, because with fewer cyclists riding on the roadway, there is less awareness. In my eyes, this fear is founded; vehicular motorists don’t view cyclists as equal, valid roadway users, despite our limited infrastructure reminding us we should be through Sharrows and equally insufficient signage stating “Share the Road”. With recent advances in infrastructure design, such as the inclusion of cycle tracks, cycling can be seen as safer, since most of the injuries associated with cycling are due to interaction with motor vehicles. When examining cycling injuries and accidents, there are three usual suspects: the road design, motorists, and the cyclist. In the States, the infrastructure sets up the cyclist to frequently interact with motorists that may or may not be aware of the cyclist. In the Netherlands, safety when deciding whether or not to bike is hardly a second thought. Two of the three situations that a cyclist is injured are eliminated; the infrastructure allows for minimal interaction between the motorist and the cyclist. The road design purposefully places cyclists out of harm’s (motorists’) way. Helmets, seen as a prudent option worn by the safest of cyclists in the United States, can be seen as an insult to the infrastructure the Dutch have carefully crafted for optimal safety. Cycling through Dutch streets, you will rarely see anyone wearing a helmet; instead, men and women of all ages cycle effortlessly and casually (Wagenbuur 2009). The difference in how the Dutch and U.S. governments view cycling’s importance, exemplified through emphasis on training programs, safety, policymaking, and, most prominently, infrastructure, has led to a great disparity within the two countries. In the Netherlands, women actually cycle more than men (Pucher & Bueler 2012). Somewhat more surprisingly, growth of cyclists in the 65+ group has drastically increased, mainly using e-bikes (Harms & Kansen 2018). Contrasted to this range in both age and gender, the United States does not share a similar demographic of cyclists; the majority of bikers are male and relatively young. There is a mindset here that only fit people wearing spandex can bike, especially because the average American views biking for utilitarian purposes as dangerous (rightfully so). The Dutch are very proud of their cycling culture, and believe that cycling evokes joy and positive feelings. In addition to this sentiment, facts support the notion that cycling is physically healthy; the daily exercise provided by cycling can extend one’s life up to over a year. It also cuts down on obesity levels and promotes social interaction. Not to say that if the United States introduced cycling into the forefront that our obesity problem would disappear and people would become substantially happier, however there is truth to the idea: cycling promotes healthy behavior. It will take changes in leadership, funding, and objectives for the central government to promote cycling, and even more time and direction for local municipalities to accept it. Seek mentorship from different backgrounds, ages, and interests. Guidance from the University of Washington notes that a diverse mentor team will provide a range of skills and advisement areas that would not be found if you only look at your direct superiors for mentorship. Approach your mentor with clear and specific goals in mind. Your mentor should know your schedule and how often you intend to keep in contact. Look to your own weaknesses. If you know that you struggle with being assertive or often find yourself seeking positive reinforcement, look to advisors and superiors that are known for these strengths. Keep your circle small and interactions minimal. Finding mentors that share similar interests but can offer unique experiences and perspectives can be found outside of your trusted professor’s office hours. Be visible and put yourself out there with unlikely people; the more discussions initiated corresponds to the likelihood of encountering a solid mentor. Be passive and apathetic. Many people do not purposely act this way, but rather become nervous in the face of their superior offering feedback that may be difficult to accept. Show that you are grateful for their time and appreciative of their advisement with enthusiasm. From the information posted by the University of Washington, I have found that the most important piece of the mentoring puzzle is being on the same page; having different expectations, unsure deadlines, and vague communication methods are all quick ways to establish a dysfunctional mentoring relationship. Similar to the buzzword mentorship, the quest to becoming a great leader is one frequently spoken and advised on. Especially in college, leaders exist in many capacities and formats, which is why being a leader despite the audience and situation is crucial to forging relationships and accomplishing tasks. Knowing your strengths, weaknesses, moods, and personality traits is one of the most important ways to become a better leader no matter the setting (Vora 2014). Finding the things that motivate you, habits that make you tick, and situations you thrive in are all ways to better understand yourself. Once that level of introspection is maintained, you will find yourself understanding others better. Described as self-awareness, this sense of understanding how others receive you and respond to you is a key to better serving those you are leading and creating a more seamless effort, no matter the task. A challenge that presents itself in leadership, especially in unfamiliar settings, is knowing how to interact with people of different backgrounds. Knowing how to communicate effectively with people from different cultures is important for getting points across without coming across as too assertive or too weak. All the while, do not attempt to adopt other cultures’ communication methods, as it could come across as disrespectful and appropriative (Mayer 2015). Becoming a good leader is not a simple methodological process because each person has different experiences with leadership roles and histories dealing with others. Better realizing how you excel in certain situations and fail in others is key to growing as an impactful leader. With that said, trying to be a better leader by better understanding yourself and your peers is in vain if proper feedback is not received. Perhaps the most important aspect of leadership is the process itself of becoming a better leader; growing your skills, honing in on your weaknesses, and expanding your communication capabilities are all parts of this process. The way in which you can accomplish this growth is through feedback – both giving and receiving. While it may be difficult to accept at first, feedback should be thought of as useful data that can be analyzed to better yourself (Petersen 2013). You may see yourself as a giving, caring group leader, while your constituents see you as a pushover; knowing how you are perceived is an important aspect of becoming a more effective leader. When giving feedback to others, it is useful to not equivocate while not being overly blunt. By offering feedback with the person’s interest in mind rather than simply rambling off complaints, you are more likely to make an impact. While your coworker may have thought his e-mail was timely and funny, you may think over 24 hours is considered late, and that his jokes were disrespectful. Rather than letting this annoyance fester, providing him with the information to improve sooner rather than later in a kind yet assertive fashion is crucial to maintaining a healthy workplace relationship. Balance with the way you communicate is noted as the best way to get your point across while keeping the conversation from becoming negative. Prior to learning about bike infrastructure in the few weeks of this course thus far, I was oblivious to the plight of cyclists within Atlanta; I did not perceive our infrastructure to be lacking or proficient, but instead, never gave it a second thought. After the group cycling tour of Atlanta, I have a much better idea of how cyclists operate and what concerns could arise. The tour began on 5th Street, where a "Sharrow" exists, designating that cars and cyclists must share the road. 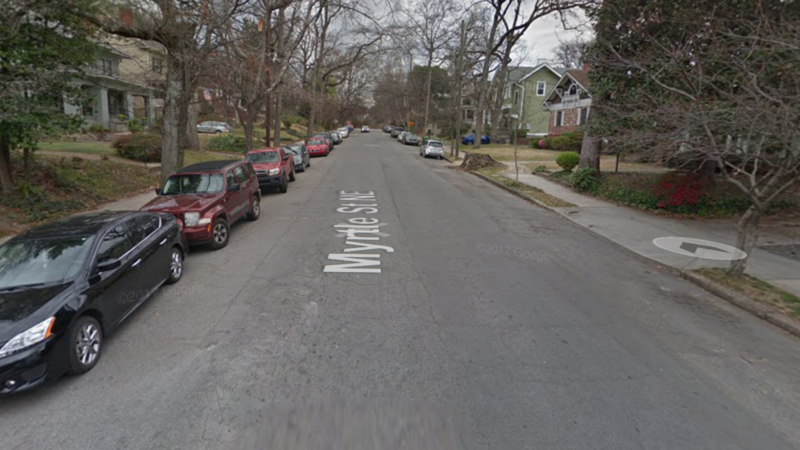 Starting off weaving through small, quiet neighborhoods on Myrtle Street, even inexperienced cyclists would feel safe despite any striping or markings indicating cyclists’ presence, as cars were cautious and scarce. Figure 1 shows the lack of striping on this road. Reaching 10thstreet, I became aware of the second type of cycling infrastructure I would encounter: a two-lane cycle track. I felt secure up until reaching Monroe, when I was the first one at a busy intersection, as the rest of the group before me had gone through the light. I asked someone to go ahead of me as we approached the Beltline, as I was nervous to be the first one through the intersection. This unique configuration is shown in Figure 2. The Beltline would be considered a safe haven for a cyclist on days without considerable foot (or scooter) traffic, with wide paths and no automobiles. Transitioning to biking on Edgewood, where a cycle lane exists, I felt comfortable but I can attribute this partly to being at the front of the group right behind Dr. Watkins; I never quickly had to question if I should continue through a light at a yellow. I noticed on Edgewood that some oversized cars or trucks would come close to me. I can only imagine that had I been alone, this scary moment would have been amplified. The group tended to get fragmented because of drivers making turns without looking and lights changing. Finishing the tour once the group dispersed, I continued onto the Path Parkway by mself, and again felt very safe, as it is detached from the cars’ roadway. Figure 3 shows the end of my journey, to which I returned to the safety of campus roads. The paths traversed on the group cycling tour were the best Atlanta has to offer. Had the tour took place on 10thStreet west of I-85, I am sure my experience would have been far more frightening. Cycling with a sizable group filled with mostly experienced cyclists was a source of comfort, however my experience would have certainly been different had I been alone or if the automobile traffic had been worse, with impatient and mindless drivers. 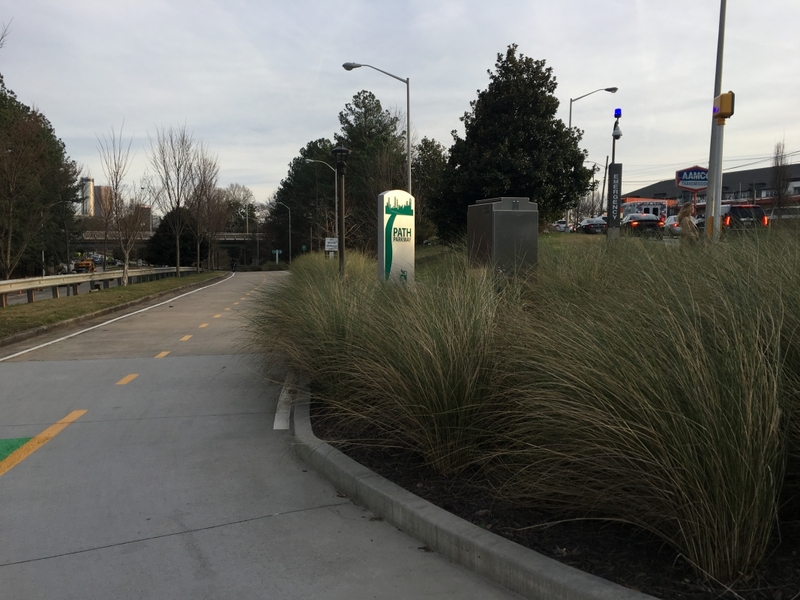 Without a doubt, Atlanta’s infrastructure has seen considerable improvement in the past few years, and even within the past couple of months, such as the new cycle track that continues on by the Georgia Aquarium. Despite the recent strides made in adding cycling infrastructure to American roads, it still feels like roads with bicycling infrastructure are a rare privilege. The Dutch emphasize cyclists as the priority user rather than an afterthought. As for their infrastructure, elevated paths distinguish between different roadway users and makes cycling and walking far safer (Wagenbuur 2009). In Atlanta, our group could not stay together because of frequent stops, and because of added cautionary time, since cars were not looking for cyclists. The Dutch system allows for more seamless transportation, where cars are respectful of cyclists and cyclists can ride without being anxious of drivers’ impedance (Wagenbuur 2010). At intersections especially, cyclists have minimal interaction with cars, which is safer and more efficient than the American version (Wagenbuur 2014). This is possible through overpasses, underpasses, different elevation levels of roadways, and smart left turn design. Lights control the intersections, allowing trains, buses, cyclists, and pedestrians to each have their turn. Beyond the physical infrastructure, the demographic of cyclists is different. While biking throughout Atlanta, every cyclist we encountered was a male. In the Netherlands, women of all ages, shapes, and sizes bike to and from work just as men do (Wagenbuur 2015). Their infrastructure allows for almost anyone to use the paths safely and effectively, getting from one point to the next. The Dutch are so confident that their paths are safe that almost no one videoed had a helmet on (Wagenbuur 2009). Another interesting note is that, while in the States, many people reserve biking as a recreation activity for sunny days, the Dutch bike in the snow, rain, and cold temperatures. Simply put, the Dutch do not let much come between them and their ability to cycle to and from. There is no argument that Dutch infrastructure provides a safe way to bike. The Netherlands’ lucrative past combined with many cycling deaths paved the way for cycle paths from big cities to smaller towns (Wagenbuur 2011). I agree that American cities have a long way to go with respect to achieving that same level of comfort, availability, and feasibility. However, I believe that, in the future, the American cyclist can choose to bike to and from work, social events, restaurants, and commercial areas (like the Dutch do) without American governments needing to completely revamp the elevation of roadways and model our cities like Dutch cities. Changing the infrastructure would of course be ideal, and the same quote, “Build it and they will come,” would eventually apply (Wagenbuur 2011). However, for the time being, the population of car drivers in the United States needs to change their mindsets about the role of cyclists on the roads. My experience biking on Atlanta’s infrastructure was reassuring and motivating, however I am sure that if I biked daily, I would have more dangerous interactions and perhaps change my current thinking that our infrastructure does not need to be completely changed. Hi! My name is Laura Kelly and I am a third-year undergraduate Civil Engineering student with a focus in Transportation. I grew up in the town of Lawrenceville, Georgia, and have lived in the same place my entire life. I did not have much exposure to the many modes of transportation I now know about as a youngster; beyond traveling via automobile, I only saw biking as a hobby I would never be really immersed in, and public transportation as an ineffective way to travel when I had a car available to me. As far as traveling went, my family typically stayed in Georgia excluding a few automobile trips to South Carolina or Florida. During the summer of 2018 I interned in the Roadway Design group at the Georgia Department of Transportation. The juxtaposition I witnessed daily was palpable: all my life I had believed cars were the only way to travel, however getting to work I took public transportation and walked, never once relying on my car. And yet, every day at work I solely worked on roadway projects that would benefit cars, and was even told to overlook the complete streets guidelines since it was not a current priority for the department. Since that experience, and during the last two years at Georgia Tech, I have become an avid walker, and most weekends I enjoy going on 6-9 mile walks around Midtown and Downtown. I love thinking about how a high-school Laura would have never considered walking to school just because it seemed so far away, however now I walk double that distance just for fun! I have never been very far outside of Georgia, much less the United States, and have never studied abroad, so I am both excited and nervous for this trip to The Netherlands! As mentioned previously, I really enjoy walking, yet (while I know how to) have never been very big into biking, besides recreationally at parks by my house and at the beach. I really hope this course changes my mind on that and encourages me to bike around campus and to locations outside of campus. 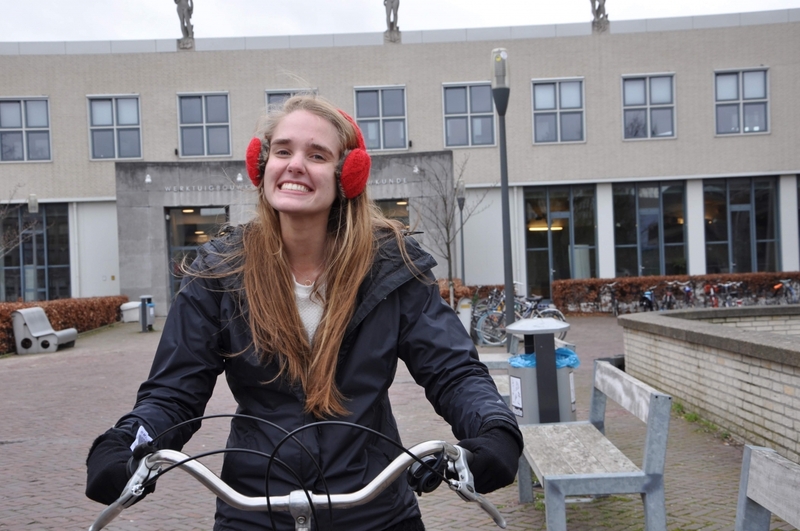 I also hope to learn about how The Netherlands’ policies encourage biking in urban areas. 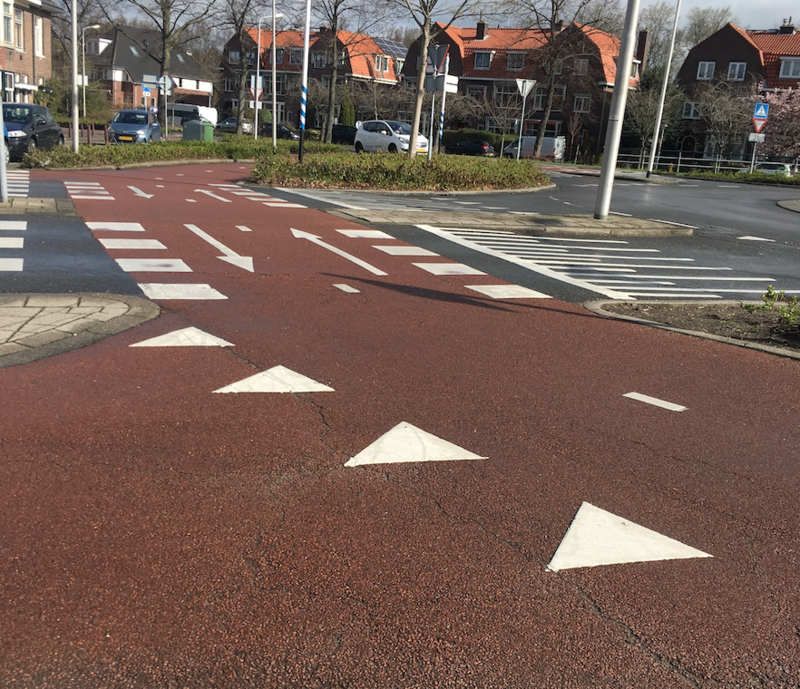 I am very excited to learn more about the signing and marking of the streets of Dutch cities, as that is one of my favorite things to learn about within transportation. I hope to make a lot of friends in this course and improve my communications skills through interactions with transportation professionals and public officials. Lastly, I am looking forward to examining a corridor that is in Atlanta using design guidance from The Netherlands, since I really enjoy working on projects near to my location that I have a personal experience with and genuinely want to improve.